Andrew Johnson gets his hair cut minutes before his wrestling match on the order of a referee, who told Johnson he could either cut his dreadlocks or forfeit. It was a dual meet in December. No division title was on the line. No playoff position was at stake. It wasn’t the individual state tournament. It wasn’t the districts or the regions. 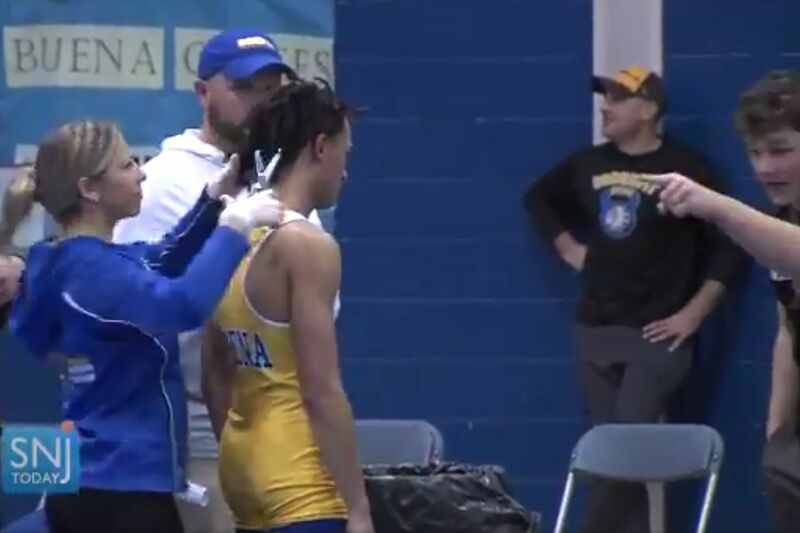 Let’s keep that in mind with regard to the actions of the adults in the room when Buena Regional High School wrestler Andrew Johnson opted to have his dreadlocks cut so he could take the mat for his 120-pound match against Oakcrest. Let’s wonder why nobody in authority – not referee Alan Maloney, not the Buena coaches or athletic officials – took that into full consideration before playing their direct or indirect role in an incident that has sparked a social-media firestorm and led to an investigation by the New Jersey Office of Civil Rights. It was a dual meet. Buena was going to win the match – wrestling folks know ahead of time how most team battles will play out – whether Johnson took the mat with his freshly shorn locks and won his bout or backed away and allowed Oakcrest to win by forfeit. There wasn’t much on the line, other than Johnson’s determination to participate in the event and help his team. Which is admirable, even “heroic,” according to Olympic gold-medal wrestler Jordan Burroughs, a product of Winslow Township High School. Johnson was let down – by Maloney, who should have used some judgment as a veteran official rather than blind adherence to the letter of the law, but also by his coaches and the Buena athletic administration. It’s a mystery why Johnson’s failure to conform with NJSIAA rules – which state that wrestlers with longer hair must wear a specific cap that attaches to the headgear – wasn’t resolved during weigh-ins or the standard pre-match meeting between the teams, coaches and the referee. But let’s focus on what happened when Johnson tried to take the mat. He wasn’t properly equipped, by all accounts. He needed a sanctioned cap that attached to the head gear. He didn’t have one. Which is another mystery. Veteran wrestling referee Ron Roberts, a Buena graduate, said he visited his old team shortly before the start of the season and specifically addressed Johnson and Buena coaches on the need for a sanctioned cap in accordance with NJSIAA rules. Still, despite all that – despite the apparent failure to heed Roberts’ preseason advice, and despite the confusion or miscommunication that marked the evaluation process during the weigh-in and pre-match meeting – this whole thing could have been avoided if the adults would have remembered one thing. It was a dual meet. In December. For Maloney, that might have meant exercising more judgment rather than being such a stickler for the rules. Yes, rules are rules. And Maloney’s defenders, of which there are many, have noted that referees are there to enforce the rules, and that Maloney was merely doing his job. OK. But the best referees see beyond the black-and-white of the rule book. They understand nuance, circumstance, context. But even after Maloney failed to take that approach, Buena’s coaches and athletic officials were in position to snip the fuse that was burning down to this bomb. Johnson wanted to wrestle. He’s a kid who has been working hard. He wanted to take the mat for his team. Again, it’s easy in hindsight to look at this situation and wonder why cooler heads didn’t prevail during those frantic 90 seconds when Maloney started the clock and Johnson had to decide whether to forfeit, get properly equipped somehow, or cut his hair. But why such a drastic step for the sake of a single bout that wasn’t going to change the result of the team match? Why allow an understandably emotional youngster to make such a momentous decision? Buena’s coaches were in charge. They might not have urged Johnson to cut his hair. But they could have insisted that Johnson walk away and let Oakcrest win the bout by forfeit. Buena still would have won the team match, and a 16-year-old would have been spared his center-stage role in the awkward spectacle of a public shearing. Johnson might have been angry. He might have been disappointed. But he still would have his dreadlocks. And nobody outside of that gym that night would have been the wiser. Because it was Dec. 19. And it was a dual meet.